Via Matt Yglesias we learn about the incredible recovery of the Swedish economy and how an aggressive monetary policy played a key role. Specifically, the Swedish central bank expanded its balance to sheet to 25% of GDP versus the Fed's 15%, it set an explicit and clearly communicated inflation target, and charged a negative interest rate on excess reserves. Swedish authorities also were not afraid to see their currency depreciate. All of these steps would horrify the hard-money advocates in the United States, but I would ask to them to consider the benefits the Swedes are now enjoying: lower unemployment, higher real GDP growth, and less overall human suffering. These figures indicate U.S. monetary authorities could learn something from the Swedes. Therefore, let me make a modest proposal: all incoming Fed officials, whether regional bank presidents or board governors, should spend six months interning at the Riksbank. And while we are at it, let's also make all incoming ECB governing council members go through the same internship. The world would be a much better place. The Riksbank pays a positive interest on reserves and did throughout the entire crisis (note that there are no reserve requirements in Sweden). The negative interest thing is just a myth (it was for a single facility for a short time and there was never any significant use of this facitlity). Terrific post. This should be an op-ed in the WSJ. I hope you submit it as such. Actually, this should be chiseled in granite outside the Fed, White House and Congress. Or, we can move to Sweden. This post tells the story of an even more succesfull monetary policy! FRED has a great deal of economic data for Sweden. From 1993 to 2008, Swedens GDPn grew by about 73cNp or on average 4.9cNp/year (4.9%/year). Unfortunately, FRED seems to give Sweden's real GDP in US dollars only. We need to see GDPr in their currency. The vertical spacing between each horizontal line is 20cNp. Noticed how they missed out on the Great Recession. It can be done. "Swedish authorities also were not afraid to see their currency depreciate." So was most of the improvement about increasing net exports? What happens when most economies have too much debt problems and try to net export their way out of trouble at about the same time? 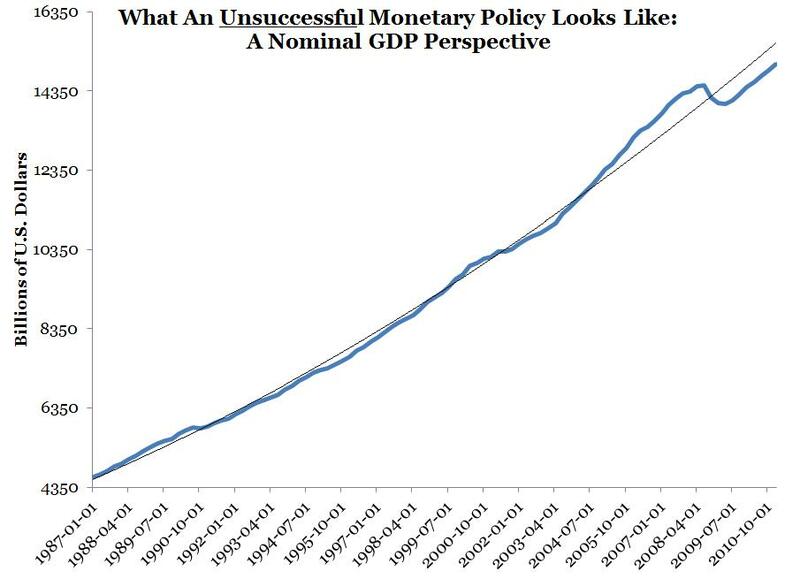 US monetary policy has been extremely successful from the point of view of the groups it was meant to help. The weightings in the social welfare function in Sweden are rather different from that in America, I surmise. Every country's citizens gets the govt they deserve so they say. Here is a graph of nominal GDP for both the US and Sweden. The left hand scale is in centinepers. Blue is Sweden, red is US. Here is GDPn for Poland added to the above graph. This post is correct, but if you're going to link to Yglesias on Sweden you should join me in debunking the myth that he's propagating that Sweden charged a negative interest rate to banks, spurring lending. This did not happen. There are things to be learned from Sweden's monetary policy but we should learn the facts about what happened and not things that bloggers and other journalists imagined happened. Swedish NGDP is now 10% below trend. Not very impressive. How Much Cyclical vs. Structural Unemployment? 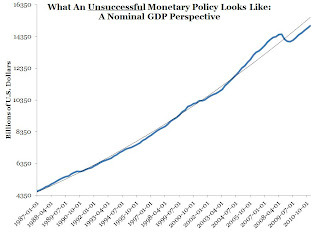 How Effective is Monetary Policy? Watch Out, George Selgin is Now Blogging! The Fed Already Repeated the "Mistake of 1937"